*AdvaCare Florfenicol Soluble Powder is GMP certified. 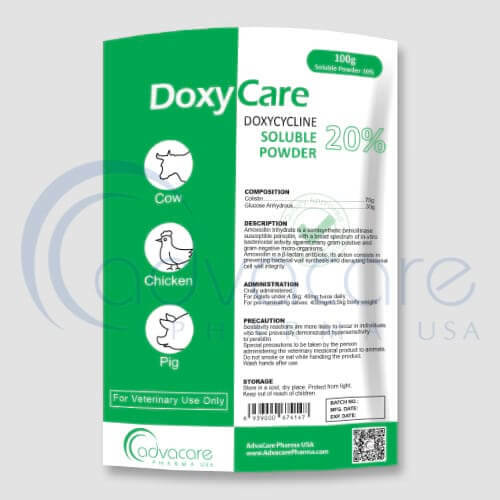 **AdvaCare Florfenicol Soluble Powder is manufactured in our facilities located in China, India and USA. AdvaCare is a GMP manufacturer of Florfenicol Oral Powder. Florfenicol oral powder is an antibacterial agent mainly used for the treatment of bacterial diseases of pork, chicken, cattle, etc. It is used to treat diseases such as haemolytic pasteurella, swine respiratory infections caused by swine actin pleuropneumonia, typhoid and paratyphoid fever caused by salmonella, chicken cholera, pullorum disease, Escherichia coli , the neck of the fish, staphylococcus aureus, etc. It can also be used for the treatment of various pathogenic bacteria of dairy cow mastitis. Common side effects include: disorders of digestive function (decreased food and water intake), diarrhea. Vitamin deficiency and infections can occur if they are given for a long time. For a complete list of all possible effects, consult a veterinarian. Always consult a veterinarian or animal care specialist before using Florfenicol Oral Powders. If the problem does not improve or worsen, call a veterinarian or animal care specialist. Pigs: indicated for the treatment of pleuropneumonia (Actinobacillus pleuropneumoniae), atrophic rhinitis (Pasteurella multocida, Bordetella bronchiseptica), polyserositis of Glasser’s disease (Haemophilus parasuis), and respiratory disorders caused by microorganisms susceptible to disease. florfenicol. Fish: indicated in the treatment of (carp, salmon family): treatment of fish with aeromonosis (rubella furunculosis, haemorrhagic septicemia), enterosis, pasteurellosis, vibrio, pseudomonosis, streptococcosis caused by microorganisms (Photobacterium damsela, Edwardsiella spp., Etc.). .) and sensitive to florfenicol. The product can be mixed with animal feed or water. Consult an animal care specialist for dosage instructions. Do not go over what they advise and complete the entire treatment, as stopping early can lead to recurrence or aggravate the problem. The product may have a strong immunosuppressive effect if used higher than the recommended dose. The recommended overall dosage is 10 mg florfenicol per kg bodyweight in pigs per day, mixed with a portion of the daily diet for 5 consecutive days. 1 day for pigs and 8-16 days for fish of last treatment. Consult an animal care specialist for any other medication taken by the animal and its medical history before treatment with florfenicol oral powders. Administration of florfenicol oral powders is not recommended in pregnant or lactating animals and breeding boars. The use of florfenicol in combination with other penicillin antibiotics, fluoroquinolones and cephalosporins, as well as chloramphenicol and thiamphenicol is not recommended.